In the 2013-14 all USA Hockey registered coaches, officials, employees and volunteers were strongly encouraged to complete the SafeSport Program training. For the 2014-15 season, all coaches will be required to complete the SafeSport Training at no cost before they can be rostered. The SafeSport Training is valid for 2 seasons. The training was produced by the United States Olympic Committee. The training is comprised of short video segments that take approximately 90 minutes to complete, however, not all training needs to be completed in one session. We believe you will find the training very valuable and informative, and strongly encourage you to access the training. CLICK HERE to access the training. CLICK HERE to Learn How to make a Report. CLICK HERE For The Michigan Amateur Hockey Association's Background Screening. The safety of its participants is of paramount importance to USA Hockey. This includes not only on-ice safety, but also off-ice safety in any part of USA Hockey’s programs. USA Hockey has long had systems in place to protect its participants from physical abuse, sexual abuse and other types of abuse and misconduct that can be harmful to youth hockey players. These include without limitation Physical Abuse, Sexual Abuse, Screening, Locker Room Supervision and Hazing Policies, in addition to Codes of Conduct applicable to administrators, coaches, officials, parents, players and spectators. 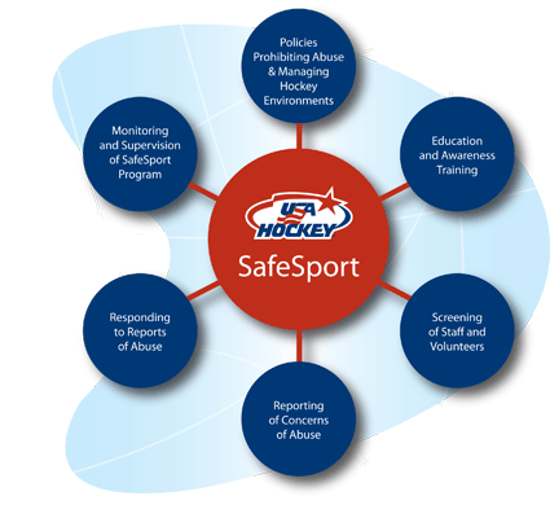 The USA Hockey SafeSport Handbook is intended to update and collect USA Hockey’s various policies to protect its youth participants from all types of misconduct and abuse. USA Hockey has ZERO TOLERANCE for abuse and misconduct. In addition to Policies, the Safe Sport Handbook includes the available and required Training of USA Hockey’s and its Member Programs’ employees, volunteers, administrators, coaches, parents and players on recognizing and reducing circumstances for potential abuse to occur; information on USA Hockey’s Screening and Background Check Program; the availability and procedures for any person to Report suspected abuse or misconduct (including protections from any retaliation or repercussions for such reporting); the procedures and means by which USA Hockey and its Member Programs should Respond to allegations of abuse and misconduct; and how USA Hockey and its Member Programs will Monitor and Supervise the SafeSport Program to help ensure its effectiveness. By combining all of these elements into a comprehensive SafeSport Program, USA Hockey intends to create the safest possible environment for participation in hockey.